Used to waterproof Fjallraven garments. Environmentally friendly wax impregnation for clothes made of G-1000® fabric. Gives a water-resistant and hardwearing surface. Made from paraffin and bee wax. 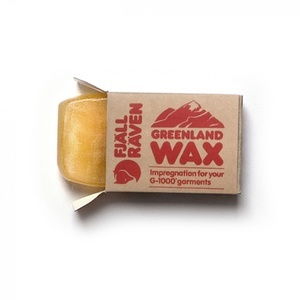 Purchase through PayPal by using the "Add To Cart" button above or use the form below to order the Fjallraven Greenland Wax 100G . Feel free to contact us if you have any questions about the Fjallraven Greenland Wax 100G .